The Alhambra is a Moorish palace and citadel located on a hill overlooking Granada, consisting of a number of palaces and buildings surrounded by walls. It was set up on the site of a former 9th century citadel by the Moorish rulers of the Emirate of Granada in the 14th century. After the Spanish conquest of Granada new buildings were added, for instance the palace of Charles V in the 16th century. 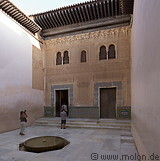 The Alhambra has no orthogonal layout and extends irregularly from east to west on the hilltop. It is nowadays one of the primary tourist attractions in Spain and has been a UNESCO World heritage site since 1984.